Answer: What's the story with George's cane? I asked a couple of questions about this mysterious statue that I'd seen somewhere, but forgotten where. 1. 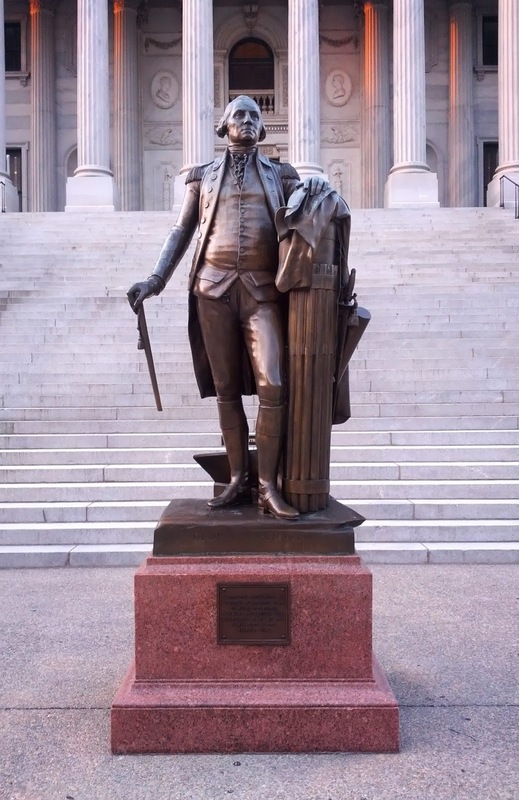 Where is this statue of George Washington located? A lat/long, street address, or building name would be enough. 2. What happened to his cane? Why haven't they fixed it? 3. What's the statue that's directly in front of George? That is, what's behind the photographer? works. There are two hits in the top row. Clicking on those images quickly tells you where it is. 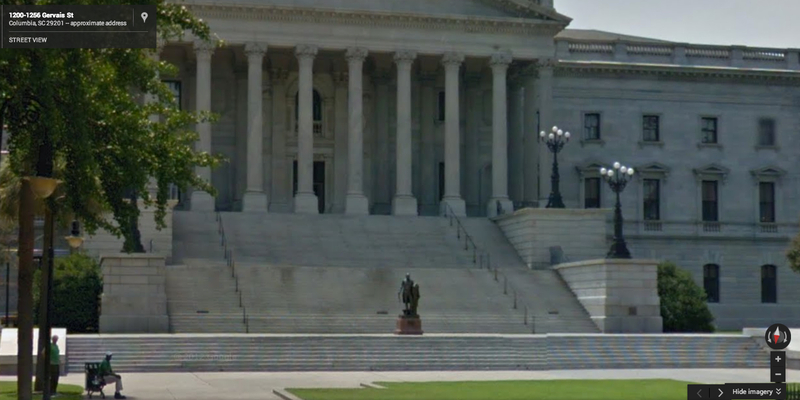 A Streetview check shows that yes, indeed, George is at the State House. Streetview of 1200 Gervais. You can zoom in to verify that this really is the same statue. What about the statue in front of George? Once you're there, just pulling out the zoom reveals the other statue, the one in front of George. I thought at this point I'd just check the Map for this location and find the statue name (just as we did a while back with the search for the wreck of the Garden City ferry). But it didn't work! The statue isn't labeled on the map! Time to switch to Plan B. I had to think for a second: What other services provide location-based information (especially about things like statues and other cultural items)? Two services sprang to mind. 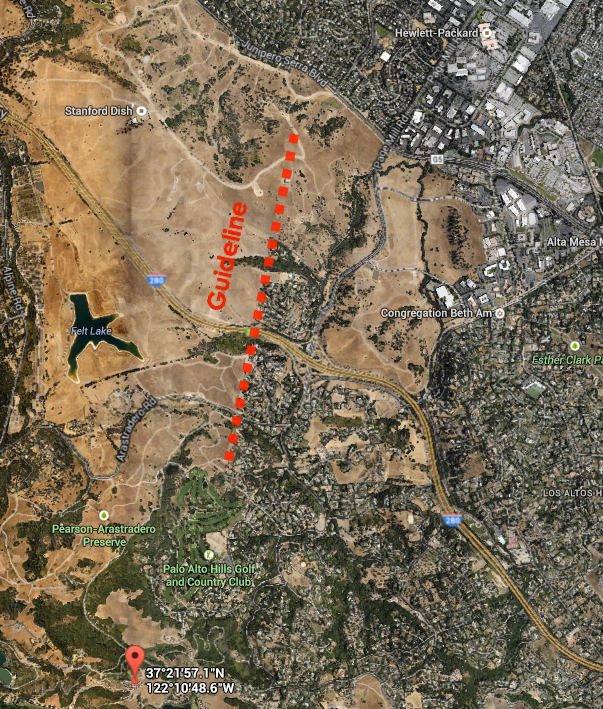 Wikimapia.org and WayMarking.com -- both are great sources of additional crowd-sourced geographical information. 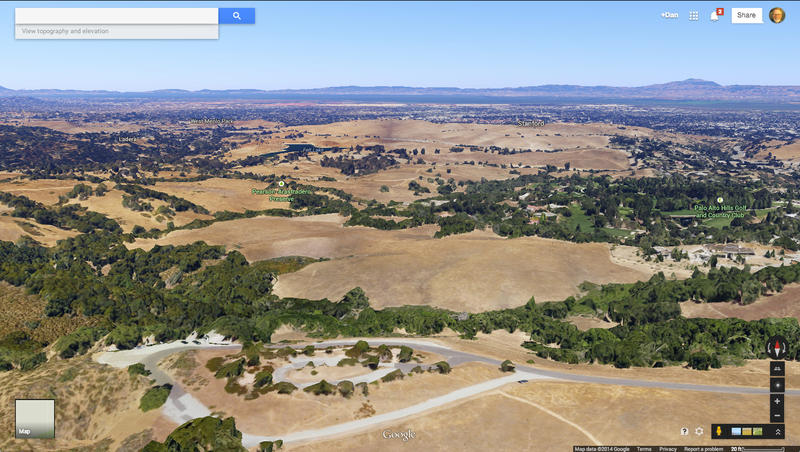 Just to check, I went to Wikimapia.org and dropped in the Lat/Long from above. 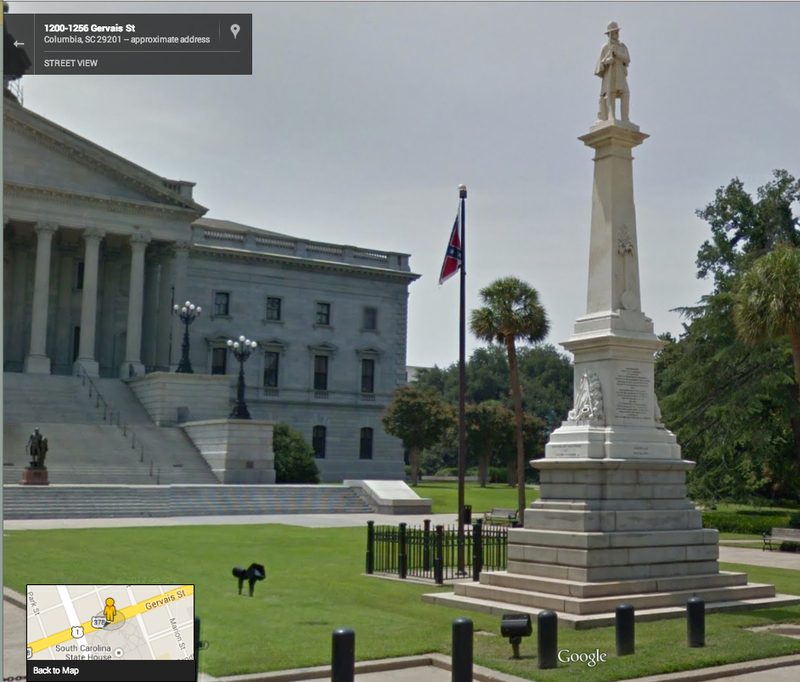 Sure enough, clicking on the location of the statue-in-front-of-George revealed that this is the "South Carolina Memorial to the Confederate Dead." 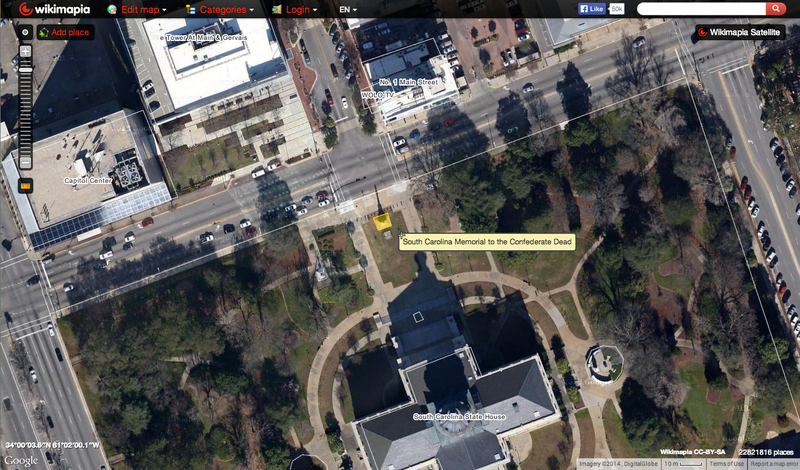 Wikimapia view of the South Carolina State House, showing the statue we seek. I also wanted to check the WayMarking site, dropped in the Lat/Long with the search term "statue," and found (just as Hans showed) the same result. Waymarking view of the monument. Note the different view on the same data. Notice the differences in the data that's shown at the two sites. 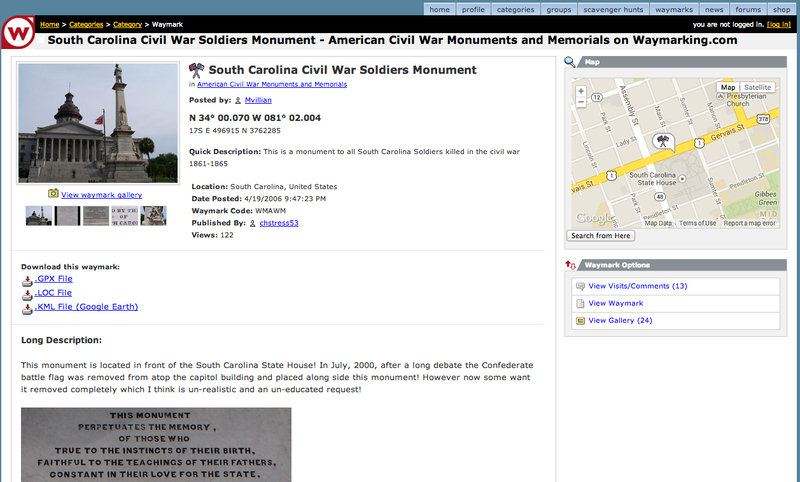 They're nicely complementary, and give me a good sense that the monument really is the "South Carolina Civil War Soldiers Monument." The Waymarking site actually has photos of the inscriptions--very nice for search-researchers! What happened to the cane? As you can see from the comments, the straightforward search quickly leads to two very different ideas about the broken cane. Theory 2: Cane broken by Sherman's troops when they occupied the city during the Civil War. This theory is given some credibility by the plaque on the base of the statue. Why the -NAACP? Turns out there was a controversy about building a screen around the statue that was done by the NAACP for a meeting on the steps of the State House. This use of minus eliminates the annoyingly invasive results. The first result was exactly what I needed--a report in the South Carolina Newspaper Project about the State House. In that report, there's a section from the local newspaper, the Columbia Phoenix, on April 11, 1865 commenting that "When in possession the barbarians tried, in a petty manner to deface and defile as much as they could . . . They seem to have found considerable sport in their practice, with brick-bats, or fragments of rocks, as sharp-shooters; and making the fine bronze statue of Washington their mark, . . . a part of his cane has been carried away among their 'spolia opima.'" (As Jon, the Unknown, tells us, the spolia opima are rich spoils taken from the vanquished. And "brickbatted" means to hit the statue with bricks.) Remember that the capture of Columbia was just 3 months earlier, so I'm tempted to believe the newspaper report as an accurate rendering. Considering the state of the State House at the time, this story seems completely plausible. Image from Wikimedia. The view north from the Columbia SC State House, March 1865. The Washington statue is near here. And, why haven't they fixed it? The sources seem to agree--as a continuing reminder of Sherman's troops excesses during the war. 1. There are many paths to the solution. To figure out what the statue was, several of us used the Search-By-Image method, then followed a link or two. But a simple search also works well. What this tells me is that when a particular method doesn't work, be sure to just move on and try another path. 3. Remember other resources on the web. I went to Waymarking and WikiMapia and both two slightly different sets of resources, both of which were excellent. 4. Cross-check your answer. As we saw, there are (at least) two different stories behind the broken cane. One of the results was a bit thin (even though it was from an ostensibly credible source). The other had references (and images!) from original source documents of the time and was consistent with other things we knew about the situation. Keep your curiosity up, even in the face of cannonball attacks! Wednesday Search Challenge (4/26/14): What's the story with George's cane? A true story: I was traveling somewhere in the southern states when I took this picture. It's remarkable for a couple of reasons--I can't remember where I was when I made this shot (I'm sure this never happens to you! ), and I also remember that there was another statue directly in front of this one. The problem is, since I can't remember where this shot was taken, I can't figure out what the other statue is. Can you help me out? This is clearly a statue of George Washington, but what else can you find out? Remember to tell us HOW you found the answers. Answer: What's that thing on the horizon? 1. What is that white thing labeled as #1? 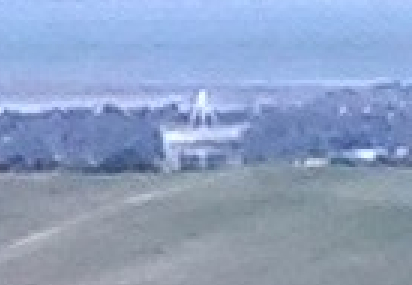 Can you find a nice video of this thing close up so we can REALLY see what it is? 2. See that line of trees labeled #2? What kind of trees are they? 3. What's the name of that big mountain at #3? Figure 1: A higher-res photo taken from the same place (with a better camera). I used a couple of different approaches. #1: Look for nearby images / data that can tell you. I knew the lat/long ( 37.365861, -122.180174 ), but it's unclear what direction this is. By just going to Maps and dropping in the lat/long, you'll get a map like this. Notice the pin in the bottom. That's where the photo was taken (that's the exact lat/long). Now, which direction is the photo? 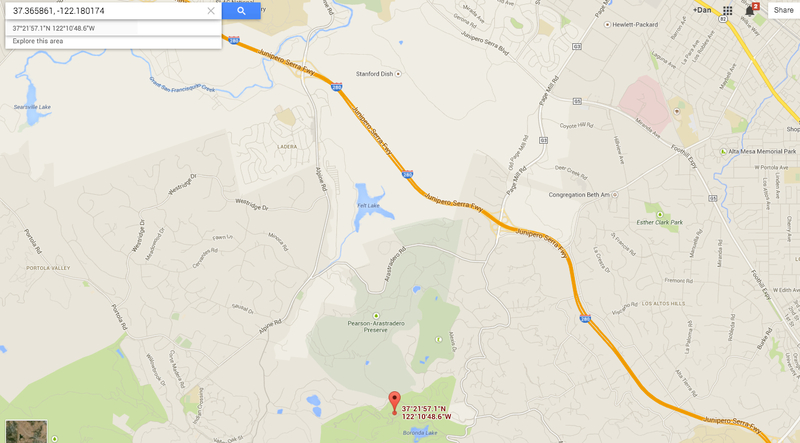 Figure 3: The location of the photo as shown on the Google Map. If you zoom in a bit, you'll see this. At this point my first reaction would have been to use Streetview to look around. But a quick check shows that there isn't a Streetview image here! (Why not? It's a private park.) So we'll need to try something else. How else can we figure this out? Let's explore the nearby images. If you then click on this Images tab in the lower right corner, it will open up a row of nearby images at the bottom of the Map, like this. 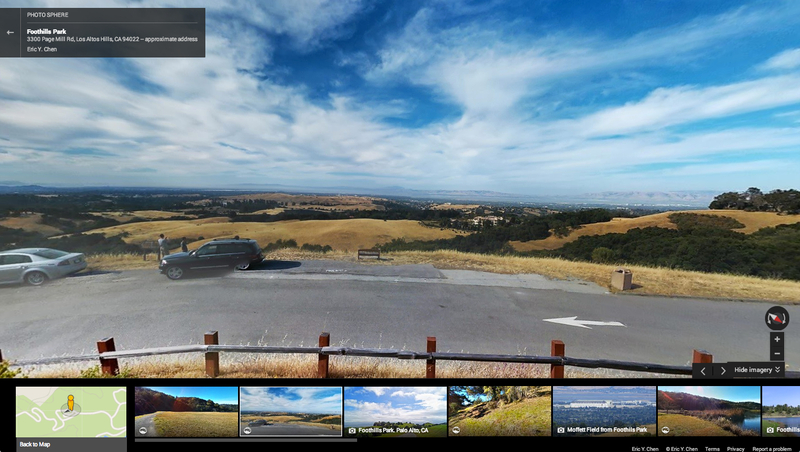 If you then explore a bit by clicking on the images, the first image will be this, a Photosphere taken just a few steps away from the photo site. That's great! Now we can look around and get our bearings. Clicking on the image brings it into the main window. Now, if you go back to the main map (as shown in Figure 1), just running your finger due north from the site leads you to a few different things. 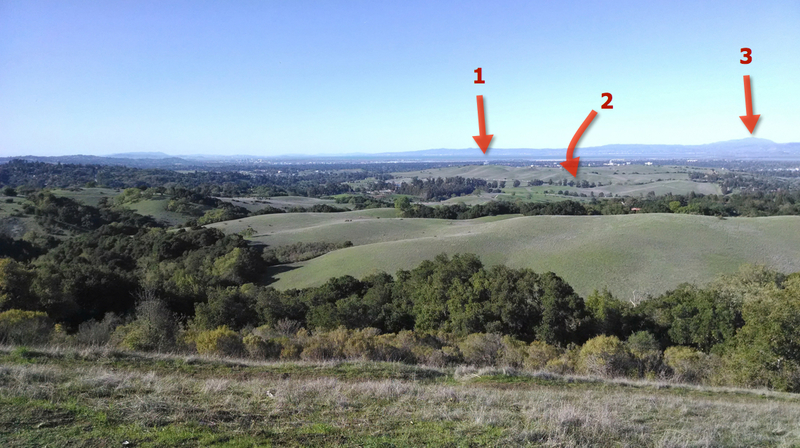 There's the Pearson-Arastradero Preserve, then Felt Lake, then the Stanford Dish. Okay. What's a "Stanford Dish"? tells us that it's a big radiotelescope that was built in 1966 by the Stanford Research Institute (aka SRI). 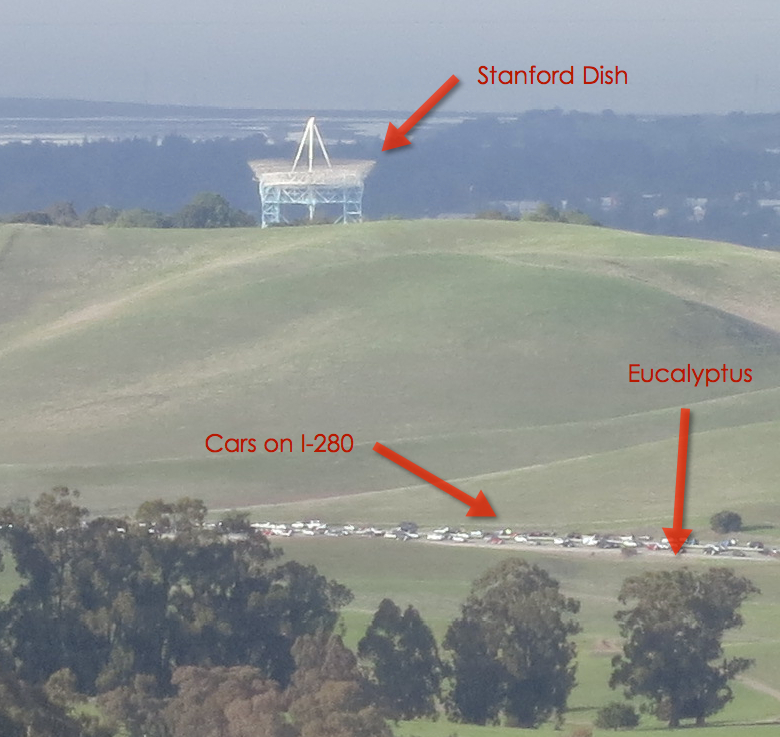 And, by looking at the map, it's pretty easy to see that I-280 ("The World's Most Beautiful Freeway," or so it says on the signs) is between me and the Dish. That's what's causing the "blobby white line" in the image. There are two ways to figure this out. The most obvious and straightforward way is to look for a clear marker that's nearby in the image that's ALSO in line with the distant image. 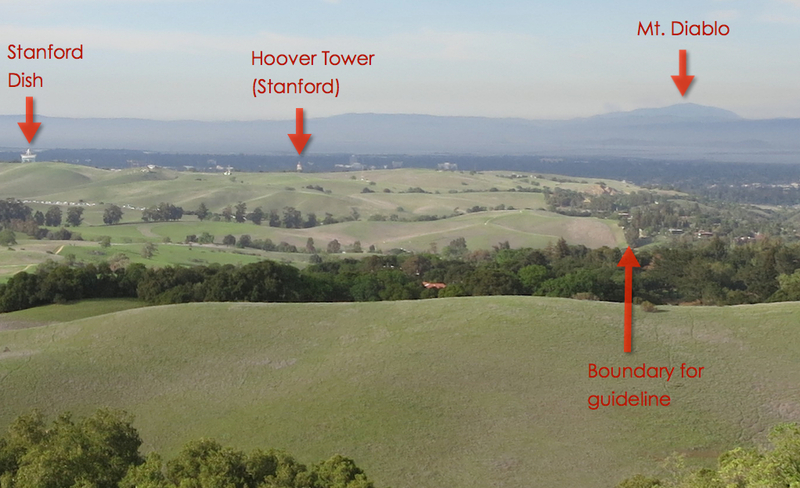 Note the guideline that follows the property boundary (it's the edge of the field where the Dish is located). together taken at different times. Now, I just zoom out from my location, and pick up the guideline and extend it outward, looking for where it intersects with a named mountain. I could have done this in Terrain view, but I figured a mountain this big would show up in the regular map. And I was right--it does. First I start with my local (zoomed-in) map image. Then I just copy the arrow from the first image to the second (zoomed-out) map and paste it there. 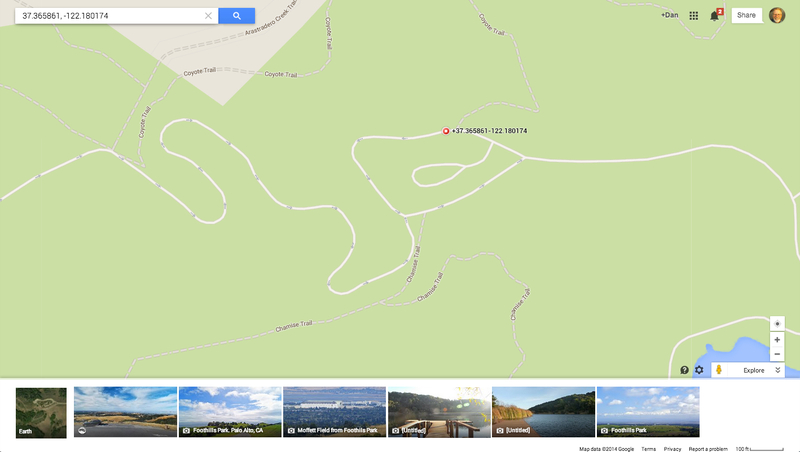 Note that I have NOT rotated the Map, so the heading on the arrow will be the same. 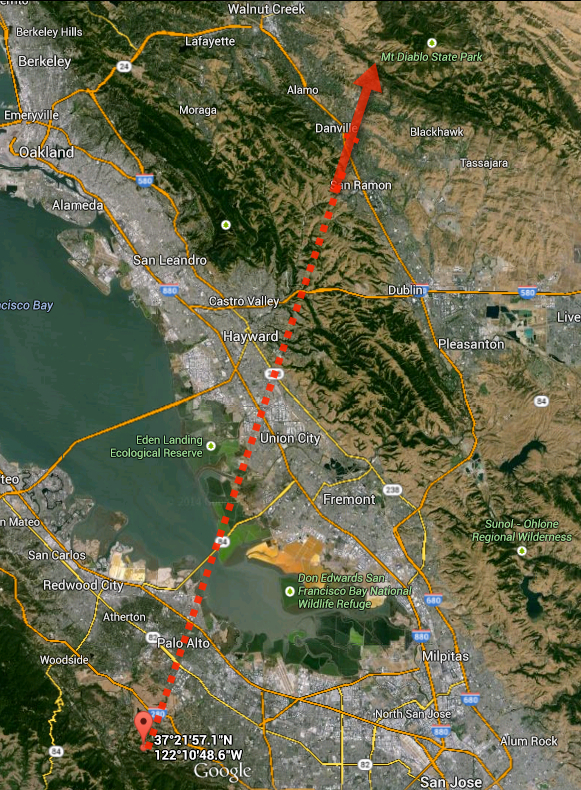 Look carefully at the top of the arrow and you'll see the most plausible answer: Mount Diablo. 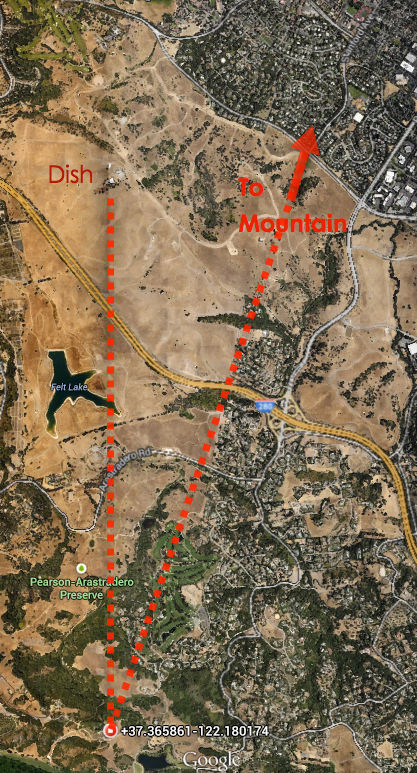 Of course, a quick check for images of Mount Diablo shows that this is clearly the same mountain as we see in the original image. A panorama taken in Earth view mode, tilted down so you can see the mountain on the horizon. Once you're in this mode, many things become possible. In particular, you can zoom into the mountain (use the + button on the lower right), and then CLICK on the mountain! #3 What about the trees? If I was to guess, I'd say these trees are eucalyptus. You'll see that I wrote in an earlier blogpost (back in November, 2011) "In the above image you can see a long line of trees just below the lake on the left. That's Felt Lake in the Stanford University foothills. But those are 60 foot tall eucalyptus trees that used to mark the southern end of the old Stanford farm." If you check, you'll see I took the image in the same place as the map shown in that earlier blog post. But you could also go to Streetview and check out the trees. 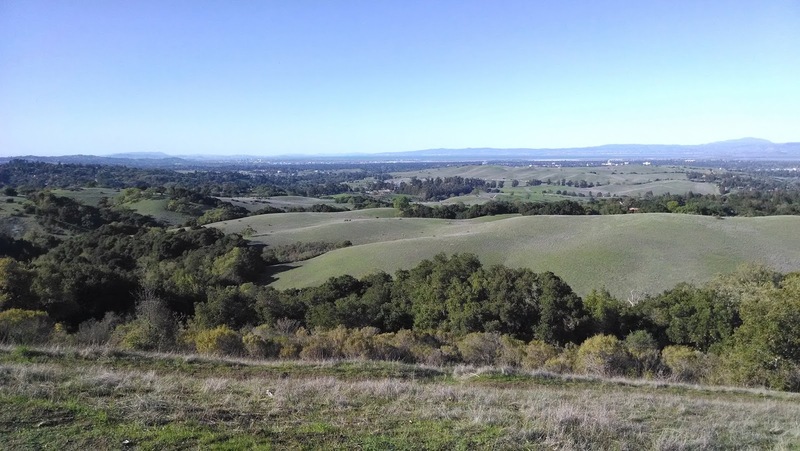 You'll see them from the entrance to the parking lot at Arastradero Preserve. Compare with the above example: those are eucalyptus. Search Lessons: This was a classic multi-method problem. I don't think you can solve this one just by looking on Maps alone--you have to combine information from different resources (Maps + Earth + Streetview + regular queries). The trick of extending the guideline along a known feature out into the rest of the map is an old trip of navigating from physical paper maps. If you've ever spent time in the backcountry carrying around topo maps, this is a common method. The initial trick of figuring out the heading by looking for nearby images is an incredibly valuable tactic. Check out nearby images of all kinds. You can usually piece together the orientation of the images you're trying to understand. Comment: What's that thing on the horizon? SearchResearchers are doing pretty well. Nice job so far. For readers who haven't had the chance to work on it yet, let me give you a bit of a clue. Here are a couple of images that I'm zoomed in for you. Figure 1: The image zoomed in. In this image you can see the "white thing" much more accurately. You can also, in this view, see the trees a bit more clearly. Regular readers might recognize this scene with the trees. Once I zzome in like this, I NOW see that white line of... something. It's kind of lump and irregular, and I have no idea what it could be. (Truthfully.) Will have to check it out. All I did in these images was to push the scale (in this case I used Apple's Preview tool, but you can use image manipulation tool like Photoshop or Gimp). Be careful, though, that the package you use doesn't smooth the image too much as you zoom. You want to be able to see the actual pixels when you're zoomed way in. Figure 2: The image zoomed to the point of seeing the pixels. I'm looking for a good handbook on photo interpretation that I can point everyone to, but I'm not having much luck. The books I've been finding are all either not-available online, or were written pre-2000 (and therefore have slightly old examples and no mention of Google resources at all). The number of available images that have come available in the past 10 years should be causing all of the photo interpretation books to be re-written! So if you know of any good ones, let me know. We'll post it in the blog for everyone to learn from. Wednesday search challenge (3/19/14): What's that thing on the horizon? YESTERDAY I mentioned the Verification Handbook, which has a section on "Verifying Images." The key idea of that chapter is that we all, in our role as literate online researchers, need to learn a bit about photointerpretation. That is, we need to learn how to look for clues in an image to figure out what it is we're seeing. That's essentially today's Search Challenge--What is it that I'm looking at? I won't surprise you to find out that you probably can't figure all of these out just by looking at the picture. You'll actually have to do a little triangulation to figure out what all of these things are. Triangulate away! As usual, please tell let us know what the answers to #1, #2, and #3 are... but just as importantly, HOW you found the answers. What resources did you use? What queries worked for you? I'm curious to see how everyone will solve this classic photointerpretation challenge. Here's the full-size unedited image. Right click (control-click) to download for analysis. I don't often recommend a book, but when I do, you know it's a good one. 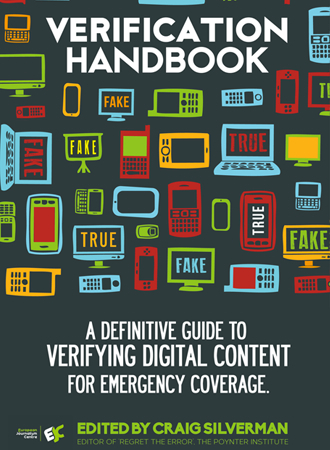 The Verification Handbook is a collection of short chapters about how-to-verify-social-media-information. It's edited by Craig Silverman of the Poynter Institute (an organization you should know about) and the creator of the blog Regret the Error. Each chapter is a story and guidelines about how to verify the information you see flowing past on social media. While it's intended for professional reporters, there are a LOT of lessons in here for us in SearchResearch. I'll be walking through some of the chapters that are especially relevant to SRS in the weeks ahead, but I wanted to give you a pointer to a book that I suspect most regular readers will find fascinating. This chapter includes two well-known case studies. There's a free PDF download of the book. (Thanks, Poynter Institute!) Get it. You'll enjoy the read. 1. What did a gravity man do? Where did he do it in California? 2. Is there any place you can ride a gravity car now? 3. Can you find a video of people descending in a gravity car? 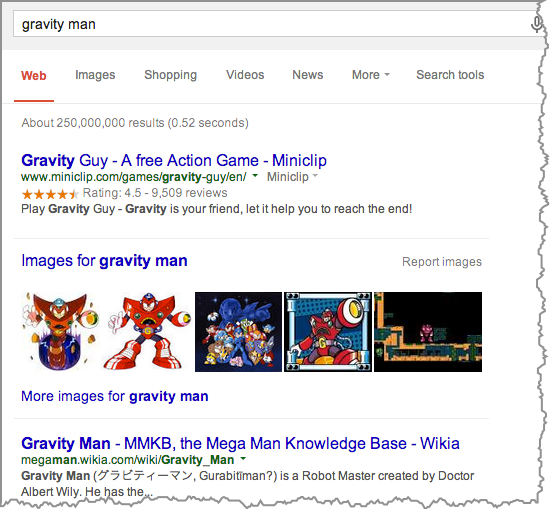 So I did the obvious first search to figure out what a gravity man was! ... and was surprised to learn that it's not rare at all! There are all kinds of Gravity Man hits! This is such a common phrase that just quoting the phrase isn't going to make any difference. But the other questions indicate that the "gravity man" was somehow associated with a "gravity car," so lets try that as an angle. On that page, you'll find that the "gravity man" was responsible for "turning on the gravity," a clever turn of phrase that just means he released the engineless train down the track. On Mt. Tam, it would go 8.2 miles from the summit to the station at the base. With a 281 curves, and a top speed of roughly 15 mph, this was a great ride. Mt. Tam gravity car ca. 1915. Image from Wikimedia. I clicked on a few other links from the SERP and on the FoundSF.org site is link to the YouTube video for one of the known films of the Mt. Tam Gravity Car ride. This video from 1917 shows a pretty spectacular hotel and recreation area on the summit (now long gone), as well as every man wearing a hat. I decided to go check Google Books for the Mt. 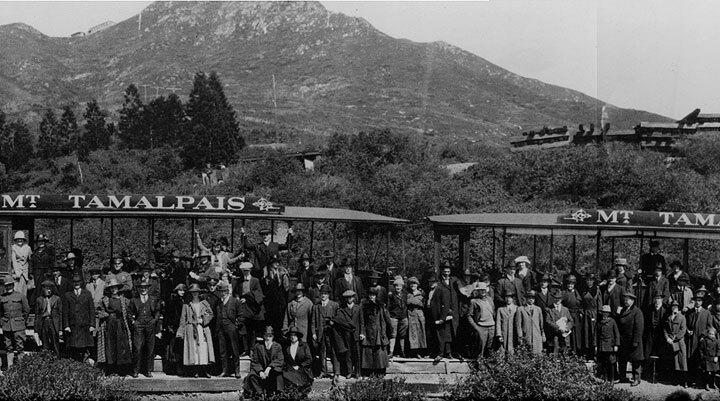 Tamalpais gravity car, and was rewarded with a discovery of the book "The Crookedest Railroad in the World." Unfortunately, it's not available for previews in Google Books (nor Amazon), so I turned to my backup book site, the HathiTrust, and looked for it there. Success! 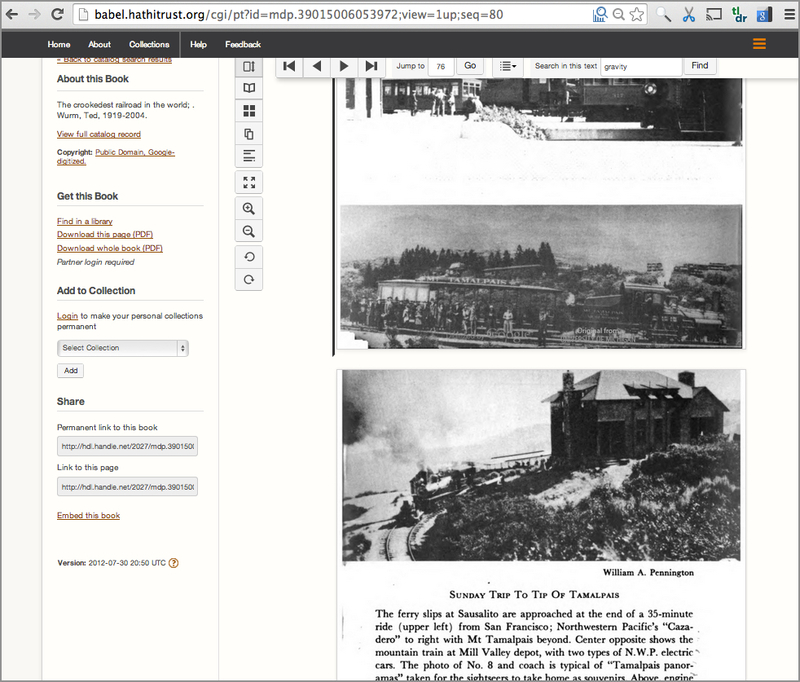 An example of reading a book at the HathiTrust.org site. This is page 76 of the "Crookedest Railroad.."
"There is Tamalpais, the one and only Tamalpais, which should be ascended by the traveler if he has only one clear day in the city of the Golden Gate. Our party went up it on the day after our arrival, and we were agreed that in all of my wanderings, we had never had a more glorious experience." In some sense, ANY roller coaster is a gravity car, at least according to the notion of a "train car going downhill without an engine." 4. Can you find a gravity car that was used for serious work? Where were they located, and what were they used for? The Wikipedia article on "Gravity Railroads" (found a few links down on the first SERP) gives the special additional sense of a "a railroad on a slope that allow cars carrying minerals or passengers to coast down the slope by the force of gravity alone." This qualifies as "serious work." And this article points to several other gravity car lines, including a couple in Pennsylvania. Although they no longer exist, at the time the Mauch Chunk Switchback Railway was a technological marvel, attracting visitors from far and wide (including Thomas Edison and Ulysses S. Grant). Built in 1827 to carry coal down the mountainside in northeastern PA, it quickly evolved into a tourist attraction on the weekends. This gravity rail became the inspiration for the 1884 "Switchback Railway" on Coney Island, the first purpose-built entertainment roller coaster (in the US). Not far away from the Mauch Chunk was another gravity line, The Delaware and Hudson Canal Company ran an extensive gravity railroad system from 1828 until 1898. The 55-mile (88 km) Pennsylvania Coal Company Gravity Railroad was the longest such line, and operated until 1885. In 1886 it was purchased by the Shohola Glen Summer Resort (1882) and used as an entertainment ride until 1907 (just before the Mt. Tam ride was set up). Oddly enough, the Delaware & Hudson gravity cars would drop their coal loads into the Delaware & Hudson canal boats, which would they carry the coal downstream to the cities of the northeast. But because the canal boats had to cross several rivers at a different height than the river itself, four aqueducts were created to carry the boats OVER the river. These aqueducts were designed and created by John Roebling, the man who would go on to design and build the Brooklyn Bridge. He also is credited with popularizing the use of wire rope in suspension bridges (e.g., the Brooklyn Bridge), and ultimately in the Golden Gate bridge--which you now have to cross to get to Mt. Tamalpais. 1. Know the HathiTrust.org site. Keep them on your short list of places to search for books. They often have full-view versions of books that aren't available anywhere else. 2. When the first query (e.g., [ gravity man ] ) turns up with way off-topic results, don't panic. Just change your search to another target of opportunity. 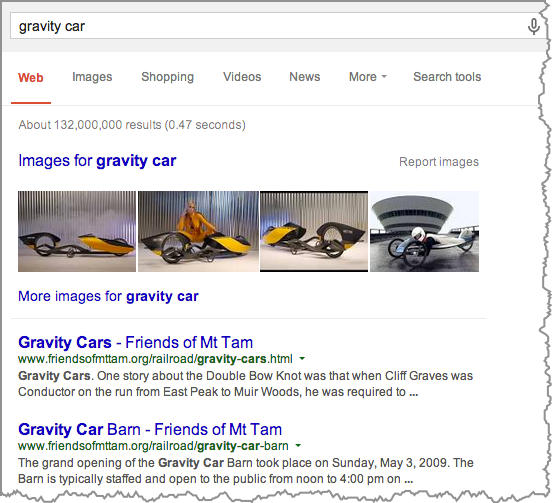 As always, be aware of other phrases ("gravity railroad") and terms that are specific to your search. 3. Pay attention to small surprises along the way. I stumbled over the Conan Doyle connection purely by accident. These are great fun. Put them in your notes for later use.